When the S.S. Lurline sailed from Honolulu on March 14, 1941, she carried aboard her two of the last loves of Edgar Rice Burroughs. Alongside of Florence, ERB's wife of six years, sailed her son Lee and daughter Caryl Lee. The latter child, age nine, could not have known she was leaving her halcyon childhood days forever behind. But such was the case. For she and Ed Burroughs (whom she always called "Ebby") had formed a father-daugher bond of real love that would never be duplicated and could not be denied. ERB in a gorilla suit - a 1936 party. Sipping a cocktail through a straw. "To Caryl Lee with much love, "Ebbie"
Caryl Lee must have felt at the time that she didn't need another father. After all, it was "Ebby" who had told her all of those funny "Grandpa Kazink" bedtime stories; it was Ebby who had entertained her and Lee on family vacations, who had cavorted with them in swimming pools at Sunset Plaza, Palm Springs and Kailua. It was "Ebby" who had donned a gorilla suit and pretended to be an escapee from the Los Angeles zoo, and who made for her a donkey out of coconuts at Lanakai. In a 1968 interview with Irwin and Cele Porges Caryl Lee said of her relationship with ERB: "I felt part of him . . . I mean, they can say he didn't legally adopt you, he's not your father . . . it doesn't make any difference. He is my father, he was my father. This man raised me, gave me my childhood." 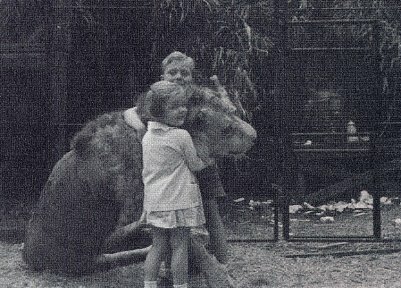 Caryl and brother Lee with stuffed lion. 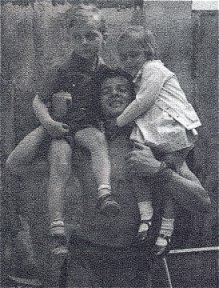 It would have warmed Burroughs' heart to know that this little girl he had loved as his own would, in her full adulthood, remember him so kindly as her father. In the many letters he wrote to her after their fateful separation he often expressed the hope that she would continue to love him. We can only wonder what ERB did with his love for Florence after their final goodbye. Perhaps he transferred a portion of it to Caryl Lee, not wanting those years of his second marriage to simply vanish in an ocean mist. 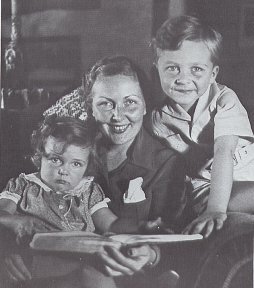 reading to her children Caryl Lee and Lee. 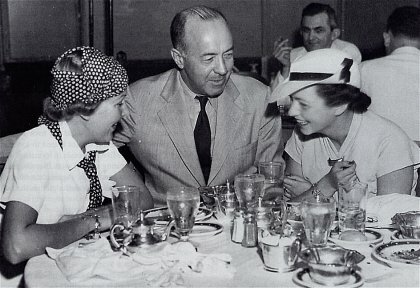 Ed and Florence (L) lunch with Mrs. Fred Mandel, Jr.
She was born Carol Lee Dearholt (according to a printed birth announcement) at Hollywood Presbyterian Hospital on November 29, 1931, the second child of Ashton Dearholt and Florence Gilbert Dearholt. The change of spelling from Carol to Caryl occurred at an early age, as she became Caryl Lee Burroughs when her mother married Edgar Rice Burroughs in April of 1935. 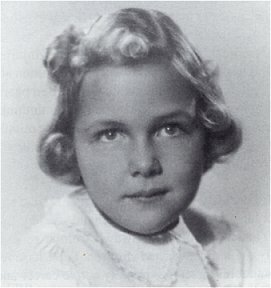 After attending several public grade schools Caryl Lee completed her formal education at the prestigious Marlborough School for girls located in Hancock Park, Los Angeles. By the time she was twelve Caryl Lee had expressed a strong desire for a horse of her own. ERB could not buy her the dream horse she yearned for (he drew one instead); but he did assist her in purchasing a dog in 1943. 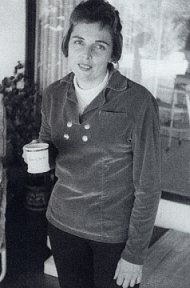 In 1968 Caryl Lee -- now Cindy -- related to Porges, how in the late 1940s, she would make her way to the horse stables in Burbank and from there ride a horse to visit "Ebby" at his Tarzana office. An affinity for animals became the dominant theme of her life. Her mentor in her chosen field was famed Hollywood animal trainer Frank Inn. Cindy got her start cleaning kennels at Frank Inn's animal compound located in Hasley Canyon in Santa Clarita. She quickly blossomed into one of his best animal handlers and trainers. Cindy's professional association with Frank Inn continued many years. 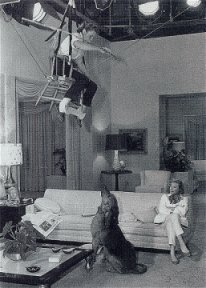 Cindy suspended in chair while her trained dog "Mr. Bones Buckshot"
During her long career Cindy worked for all of the major motion picture and television studios where she was variously known as Cindy Lee James, Cindy James Cullen and Cindy Cullen. She was a primary dog trainer for many of the Benji films which employed several look-alike animals, each one trained to do specific tricks. 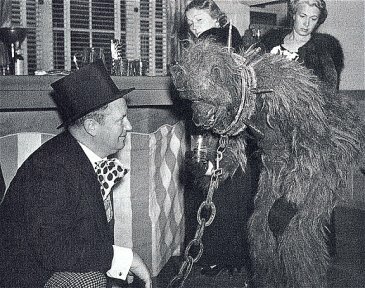 She also worked on a 1960 re-make of A Dog of Flanders as well as some of the Gentle Ben TV episodes. Cindy was a workaholic who often rose between 2:00 AM and 4:00 AM to load animals into trucks and trailers, then drive to studios and film locations across the Southland. Normally there was plenty of work to go around. 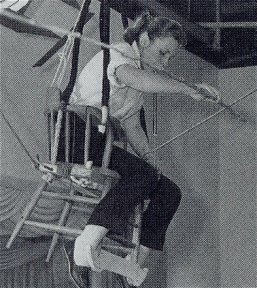 Cindy would often call in other animal trainers to help with big jobs. Lee Chase lent a hand upon occasion also. He remembers one morning in particular when he helped his sister manage a flock of unruly pigeons. Cindy bore many nicks, scars and other injuries related to her profession. She was once bitten severely in the arm by one of the Gentle Ben bears. The bruin became agitated when some unthinking person drove a motorcycle through the middle of the film set. Cindy, unfortunately, was the bear's closest target. Married and divorced three times (her second and third husbands were a San Fernando Valley fire chief and a California highway patrolman respectively), Cindy never had children. Lee Chase recalls that his sister's extremely active career and many beloved animal pets kept her happy and that was enough for her. Cindy's favorite horse was named "Heilbrand." Favorite dogs, which appeared in many movies and TV commercials, were a toy poodle named "Frostie" and a German Shepard-Poodle mix named "Hobo." The ashes of these and other favorite pets were kept in urns upon Cindy's fireplace mantle. Highlights of Cindy's life included travels to Canada, Mexico, South America, Thailand, Holland, Belgium, Italy, Greece, and other locales to work on various films. The Internet Movie Data-base lists a few of Cindy's more recent film credits (as animal trainer). These include Lawnmower Man 2: Beyond Cyberspace (1996); Harry and the Hendersons (1987); The Lonely Guy (1984); Embryo (1976); The Dove (1975); and The Daring Dobermans (1973). In later years Cindy underwent heart by-pass surgery and was told by her doctors that she needed a heart transplant, which latter she declined for reasons of her own. Cindy eventually built her dream home in the spectacular red rock country of Sedona, Arizona. It was there that she passed away in her sleep on July 10, 2001. She was, at the time of her passing, the longest continuous female member of the Screen Actors Guild which she first joined as a teenager. Her long-time friend and business associate Frank Inn passed away the following year at the age of 86, also in July. Edgar Rice Burroughs would certainly have been proud of Caryl Lee's life journey and the high level of success and fulfillment she attained. He who loved animals and nature so keenly was well represented by she who spent a lifetime caring for, nurturing, training and loving horses, dogs, cats, birds and other creatures. A sheaf of twenty-two original Edgar Rice Burroughs letters were discovered by Lee Chase among his sister's belongings in the summer of 2001. They date from the years 1942-1944 and represent only a fraction of ERB's and Caryl Lee's correspondence between 1941 and 1950. Other original ERB letters to Caryl Lee may be extant. 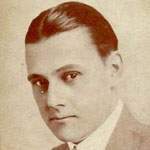 Presumably, most or all of ERB's carbon copies as well as Caryl Lee's original letters and cards are somewhere amongst ERB, Inc.'s extensive files. 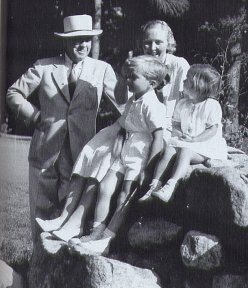 Many of the letters describe wartime events and impressions, the details of which are also found in ERB's letters to his daughter Joan and other family members. The particular charm of these letters to Caryl Lee rests in the fact that they were written to an early-adolescent girl -- a very special girl in the eyes of Edgar Rice Burroughs. Many treasures lie within. It is felt that each reader will want to make his or her own discoveries. So, with a very special "thank you" to Lee Chase, Cindy Cullen and, of course, to Edgar Rice Burroughs himself, we present to The Burroughs Bibliophiles and ERBzine these wartime letters of ERB to Caryl Lee. Burroughs, Edgar Rice. Original letters written to Caryl Lee Burroughs/Chase, 1942-1943 and 1943-1944. Chase, Lee. Telephone conversations, summer 2005. Cullen, Cindy. Original letters and photographs from her personal scrapbook. Hillman, Bill. 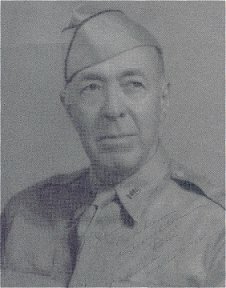 "Edgar Rice Burroughs 1940-1945: The War Years." ERBzine Volume 1019 ~ Part of the www.ERBzine.com Website. Porges, Irwin. Edgar Rice Burroughs: The Man Who Created Tarzan. New York: Ballantine Books, 1976. Taliaferro, John. Tarzan Forever. New York: Scribner. 1999. All letters are copyright 2006 by Lee Chase and appear courtesy of Lee Chase.